Teachers have gone on strike in West Virginia, Oklahoma, Kentucky, Arizona, and Colorado — and in most of these cases, they are demanding higher wages and increased education funding. It started with a nine-day teacher strike in West Virginia, where teachers were told they would receive just a 1 percent pay raise and would be required to pay more for health insurance. Eventually, the governor gave in to the teachers’ demands and gave them a 5 percent raise as well as a hold on increasing health insurance premiums. This spurred a wave of teacher strikes, and there may be more to come. There’s the old truism that public school teachers aren’t paid enough, but these strikes highlight a trend that we’re seeing nationwide: Public school teachers aren’t getting raises that keep up with inflation — and their health insurance costs are increasing. Over time, this essentially amounts to massive pay cuts. It’s a pernicious trend because raw salaries tend to increase by small amounts, so it can be hard to detect. It looks like all salaries have been increasing, but that's a bit misleading because we have to adjust for inflation. This is better than the nation as a whole, where teachers have had their pay cut by an average of 3 percent when we adjust for inflation. And since 2009, teachers in California have received a raise of about 7.3 percent. This is better than how teachers in West Virginia have fared since 2010. There, teachers went on strike for nine days and received a 5 percent raise as well as a hold on raising health insurance costs. 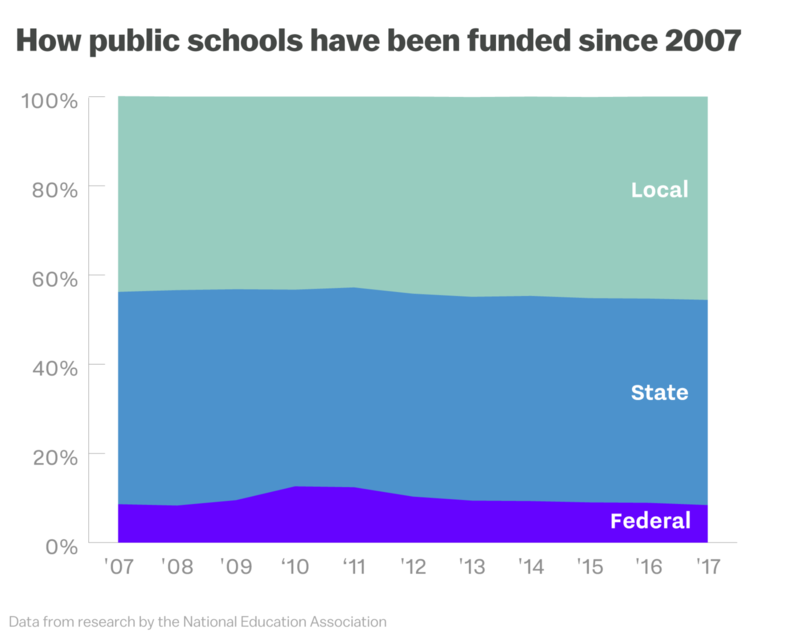 How do states pay for education? A unique aspect of the American education system is that a huge portion of funding comes from local property taxes. A smaller chunk of money — less than 10 percent — comes from the federal government, and this share has shrunk in the past few years. The feds are accounting for about the same amount as they were before the recession, but states are now contributing a little less. In 2007, states were responsible for about 47.6 percent of receipts. That dipped to 44.1 percent in 2010 and now has bumped back up to 46 percent. Meanwhile, local taxes have been increasingly funding public education. But as states deal with budget crises, and as state lawmakers push tax cuts for businesses and corporations, public school teachers haven’t gotten the raises that would help them keep up with inflation. In fact, most states haven’t restored education funding to pre-recession levels. All of this means that teachers have a genuine gripe: They really have been getting paid less. That’s not just in the states where teachers are considering a strike; it’s probably true in your state too.